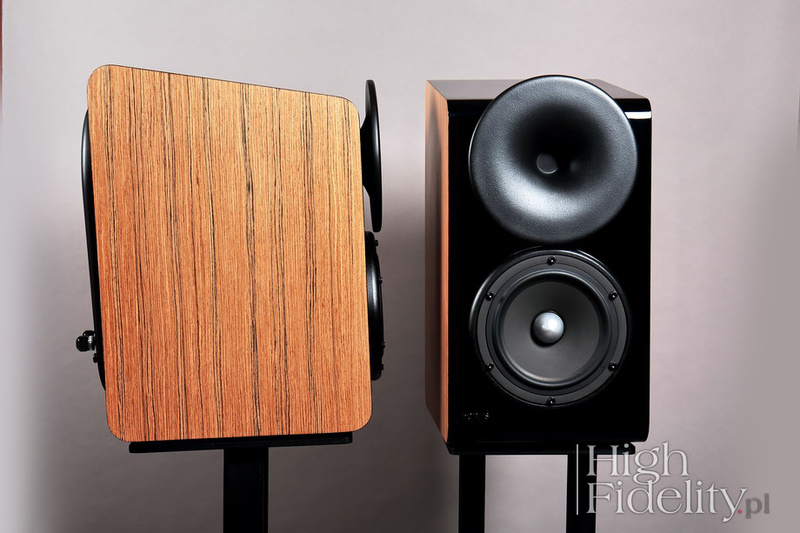 hen you hear: horn loudspeakers, most likely you're thinking about some huge speakers because first that come to mind come from Avantgarde Acoustic, Acapella Audio Arts, Blumenhoffer Acoustics and others. The horn loudspeakers are clearly divided into two types: with classic cabinets with wooden horns that are "hidden" inside the cabinets, and other ones with horns outside, most often made of epoxy resins. 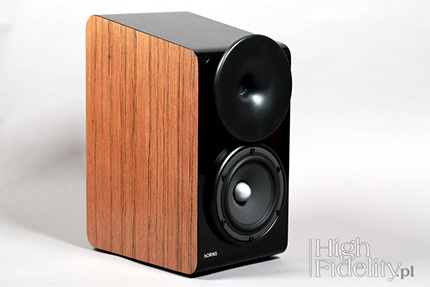 The problem with these speakers is what is also their main advantage: their size and look. They are simply too large for most rooms, or they simply do not fit in with their visual design. The same goes for loudspeakers with transmission line cabinets, in which a long labyrinth the woofers are loaded with, force large dimensions of the cabinets. These obstacles exclude such loudspeakers from the field of interest of some music and audio lovers. That is why the companies in question try to use similar solutions in smaller cabinets. And so the Avantgarde Acoustic offers model called Zero, Blumenhoffer Acoustics proposes speakers with only tweeter loaded with a horn, and – since I've mentioned transmission line - PMC found a way to fit a labyrinth into stand-mounted speaker. Everything I have written about so far also applies to the Polish manufacturer, hORNS by Auto-Tech (for short I will use the name hORNS in this test). It is a daughter company of Auto-Tech that was founded in 2000. The latter manufactures car parts and other components made of epoxy and polyester laminates. It is run by Mr. Łukasz Lewandowski, privately car, snowboard, music and audio equipment for its reproduction, lover, a graduate of the Mechanics Department of the Lublin University of Technology. The company offers both large and very large horn designs, such as Universum, but also smaller ones, in which the mid- and low-range drivers operate in classic enclosures. A separate part of the lineup consists of stand-mount speakers and small floor-standing ones. They are divided into two series: FP (the FP20 model that;s been developed for production will be the first floor-standing speaker in this series) and Aria. The FP series in its assumptions resembles what JBL products, for example the 4367 Studio Monitor (take a look at the FP10 model: HF | No. 138), while Aria is a turn towards classic, small floor-standing speakers, with a distinctive element in a form of a horn-loaded tweeter. HORNS tries even harder to adapt horn speakers to a home environment with the Atmosphere model. It's a small, two-way monitor, with some interesting solutions in it. It was created to transfer the sound from large speakers to small rooms. Why bother so much? After all, almost all other loudspeakers use ordinary drivers and they are doing OK, right? True, but not quite. At the core of the horn technique is the need to improve the sensitivity of the speakers - the amplifiers at the time delivered only several watts of power. Today, this requirement does not matter, but other advantages of high-efficiency speakers are utilized. The most important among them are the perfect response, i.e. an almost direct energy transfer, flawless dynamics and better coupling of the speakers to the room, making the speakers of this type more forgiving for room acoustics. The drivers used in the Atmosphere are a bit different than those used in the other lines, right? Partially yes. In Atmosphere and Aria I and Aria II we used a horn for the tweeter, which is our hallmark, but the low-midrange woofer is a classic one, widely used in hi-fi speakers. For the Atmosphere, we used the iconic SEAS driver from the Nextel series, which make sit different from our other speakers, that feature PA drivers. This is a very interesting driver that has this special "something" to it. It offers a cool timbre and can reproduce the nature of the recording, although it does not have a high efficiency. In turn, the tweeter is a one-inch compression driver with an aluminum membrane. This driver is loaded with a tube. It delivers calm sound with no hint of harshness. Horn profiles, such as those used in Atmosphere, are your proprietary solutions? Yes, these profiles were calculated by us. We have been dealing with horns since 2008. We have several models - their curve has been simulated and calculated in-house. On the back there is a diaphragm - is this a passive radiator? You're right, usually a passive radiator can be found there. I used a classic driver with some added mass in form of bitumen pastes. In the open position it acts as a classical passive radiator, and in the shorted position, the acoustic wave that moves this driver causes a "short circuit" in its magnetic system, causing the diaphragm to stiffen up. Does it mean that in this speaker you use a combination of bass-reflex and passive radiator? Yes, it's a combination of bass-reflex and passive radiator – in open position the driver acts like a passive radiator. Bas-reflex and radiator operate in the same chamber? Where did you take this idea from? This is my original idea, I've developed it experimentally. In small and medium-sized rooms, I recommend leaving the membrane in shorted position. It's really a trick and it's very simple. In large rooms, in which this speaker could "get lost", you can emphasize the bass. Maybe it will not be the most beautiful, taut bass, but if you like bass, you will have it. In a large room, in which a small speaker can not create the proper music pressure, if you disconnect the coil of the rear driver, the result will be more bass volume. But, I must say, I prefer the version with a shorted driver. The Atmospheres are small, two-way stand-mount loudspeakers, sold together with stands. Probably the idea is to make sure they are placed at the right height, because the stands are higher than classic ones - the bottom edge of the speaker is positioned 76 cm above the floor. This means that the low-midrange driver is positioned at the level of listener's ears. It is loaded in two ways. The basic load is the bass-reflex with the port on the rear panel. But there is also a driver that is not connected to the signal, working as a passive radiator. This is hORNS' proprietary solution, which is supposed to help in filling larger rooms with sound. In smaller ones, you can give up using it (at least to some extent). Between nice WBT terminals, an extendable plunger has been placed, which can be used to shorten the transducer's terminals or open them. After they are shortened, the motor system prevents the diaphragm from moving - not quite, but enough not to affect the bass reproduction. 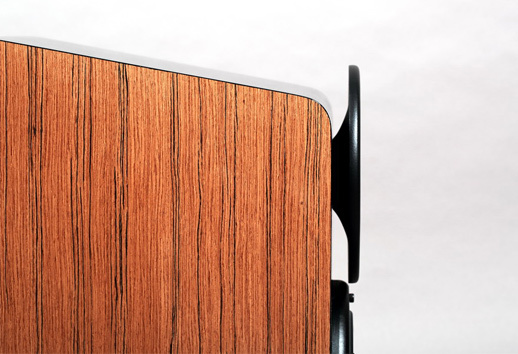 The loudspeakers feature veneered side walls with the rest of them painted black. The top wall is tilted, and the front, horizontal edges are rounded. These elements have technical justification, but also positively affect the aesthetics of the product. Its most important part is of course the tweeter's horn. It has the same diameter ø as the outer frame to which the second driver's basket is mounted to and is made by hORNS themselves. The Atmosphere is different from the other models offered by this manufacturer. This is not a high-efficiency design - the technical specifications read that its sensitivity is only 84 dB, which is not so much. The high nominal impedance - 8 Ω - and its linearization, allow usage if tube amplifiers. However, I would suggest using powerful amplifiers - tube, hybrid or solid-state. Mr Łukasz prefers tubes and hybrids, but he does not condemn transistors. This is the theory - the listening session proved that these are not difficult to drive. 99% of the speakers reviewed by me in my room sound best when taking exactly the same place as my reference Harbeth M40.1 normally occupy. This time was different. When Mr. Łukasz brought the Atmosphere to me, we unpacked them and listened to them for a while. The sound was very pleasant, but it was clear that the sound was a bit “too light”. And, as their designer told me, in some rooms they were too bass-heavy. The room I work in is around 35 m2 big, 25 m2 of which is the main room, and the rest is an open corridor – so the whole has an irregular shape. More important, however, is that the walls on the side and behind the speakers host shelves full of books and CDs, so that the acoustics of the room is not very lively. On the other hand, it is not dull either, but in some cases, this amount of “acoustical treatment” can be a problem and speakers require some help. As they did in this case. 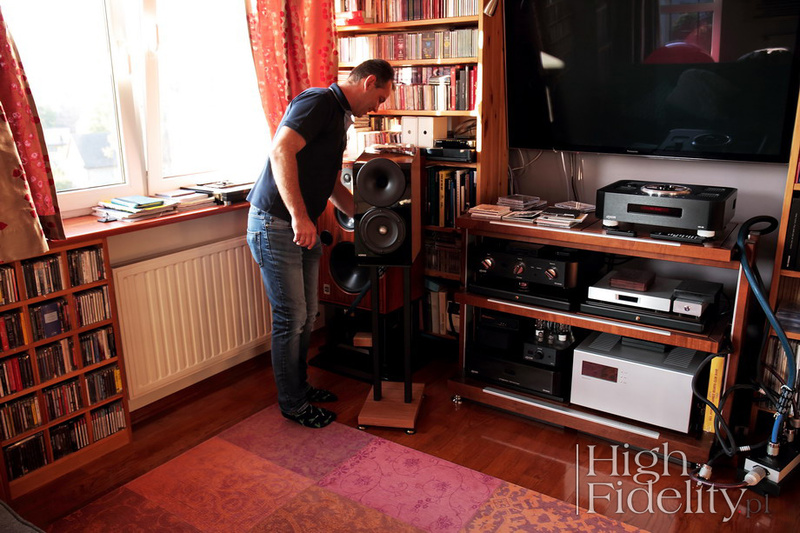 We carried out the listening session with the designer with classic speakers setup, in which the rear edge of the speakers is placed about 80 cm from the back wall (there are still shelves with books and CDs in between). After we decided to implement a different setup the Atmosphere were placed only 45 cm from the wall behind them. I used the Soulution 710 power amplifier with the Ayon Audio Spheris III preamplifier to drive them.